Thanksgiving Holiday is the perfect time to revisit the story of those first Pilgrims, who, nearly 400 years ago, risked everything, including their lives, to start a new life in the desolate wilderness of the New World. 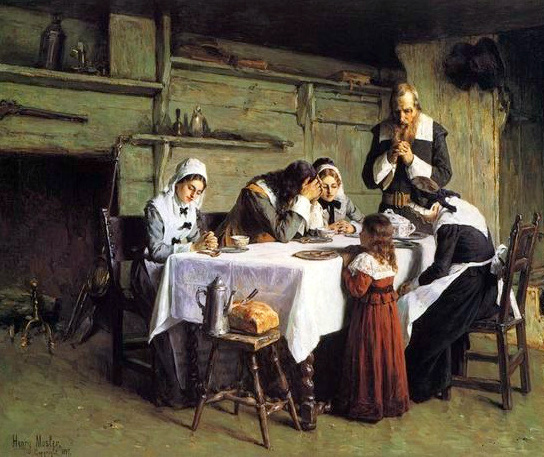 What drove the Pilgrims? Why were they willing to abandon the comforts of civilization, and make a treacherous 2 + month voyage in a crowded, leaky boat across the Atlantic ocean? It was an opportunity. The Desolate Wilderness offered the Pilgrim an opportunity to worship God and live their life in accordance with his or her conscience without fear of persecution. That opportunity did not exist in Europe. The New World held promise. How is it that very few of us have ever even heard about this part of our American history? Why don’t the government-run schools (public schools) teach these lessons to our children? It seems to me that important parts of our early history have been suppressed. We must revive them. MSNBC “Progressives” Continue To Hack Away At The Traditional Family Unit. MSNBC “expert” and Tulane University college professor Melissa Harris-Perry thinks your children are not your responsibility, but rather the responsibility of the “community.” (See video below) Of course, her choice of the word “community” is just a euphemism for the state or the government. She also talks about “investments” in the children. What she is advocating is for more resources and responsibility to be shifted away from parents and families and into government-run programs for the purpose of indoctrinating children with a left-wing, statist ideology. It’s an old idea that has been practiced before with disastrous results by the communist party under Josef Stalin, and the national socialist/fascists in Germany led by Adolph Hitler. The frightening thing about this is that MSNBC produced this promotional video for viewer consumption and therefore is giving its tacit approval to this crazy notion that parents are not responsible for their children, and that your children will be better off if raised by government “experts.” MSNBC and Harris-Perry are couching destructive ideas with nice sounding phrases, good looks and slick marketing. Der Staat will die Kontrolle über Ihre Kinder. Putting aside the fact that Harris-Perry’s expressed vision of child education is simpatico with the child rearing practices of the tyrants and mass murderers of the 20th century; there is no evidence that parents who take responsibility for educating and raising their children do a poorer job of it than parents who show little interest. In fact the opposite is certainly true. One important reason Asian students often academically outshine their non-Asian peers is because their parents are more involved in their children’s education and demand excellence from them. Another reason Ms. Harris-Perry’s idea is a bad one is the existence of the phenomenon called “diffusion of responsibility.” In large groups, where no one has been assigned personal responsibility or made to be “in charge” (unlike a parent who is motivated to assume responsibility for their children due to moral obligations or even for personal, selfish reasons), everyone tends to assume that someone else is responsible, in this case, for raising the children. This means that in Harris-Perry’s world, many more children will “slip through the cracks” because they will not get the same love and attention that only parents can give. Parents have a direct vested interest in the success and well-being of their children. Collective groups will never have or feel that same connection to individual children and therefore are a very poor substitute indeed. Guard your children, people. Be aware the Left is coming after them. You better fight them at every step of the way. Do not let them implement their crazy ideas in your communities or at any other level. Get involved and stay involved. Don’t be afraid to challenge them publicly. The most recent mutation of social collectivism will be perpetuated as an idea with the re-election of Barack Obama. It’s small comfort to know that the only thing standing in the way of its full implementation is the House of Representatives, which is controlled by a majority of Republicans. Those who understand the stakes involved must insist that they not surrender an inch of ground in this all important struggle for the future of our country. Under Obama’s misleadership the federal government’s reckless borrowing and spending will probably continue. Before long the $16 trillion federal debt will grow to $17 trillion, then to $18 trillion and so on. We will borrow more against future wealth that doesn’t yet exist. That’s a real gamble, a gamble our lenders may not always be willing to make. If our credit dries up, then what? Observe Greece. Were he alive today, I think Jefferson would agree that it’s time that Americans learn to live within their means. We must all be made to recognize that massive reliance on government for our every need will lead to the ultimate collapse of the U.S. economy. Look at what is happening to countries like Greece and Spain, where the people of those countries have been hypnotized by the hollow promises of their nanny state governments. Now the government checks have stopped coming, one in four people cannot find work, suicides are skyrocketing. We are heading in that direction. It’s time to turn this ship around before it’s too late.